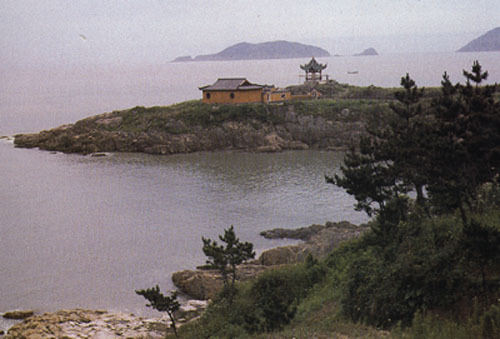 Mount Putuo (Putuoshan) lies in the sea. It is a narrow strip of an isle in the Zhoushan Archipelago. The Mount located 5 km east of the Zhoushan Island of the Zhejiang Province, is considered to be one of China's four sacred Mountains . Putuo is the Site of Rituals to Guanyin Bodhisattva and as such is yearly visited by reverent followers, all here to pay their respects to Guanyin, Goddess of Mercy. There are over 50O monks and nuns in the mountain and pilgrims over one million evey year. The main scenic spots are three sacred temples .Puji Fayu temple is famous for its ancient architecture, delicate woodcarvings and inscribed calligraphy by ancient emperors. Huiji Temple is ideally located on the peak of Foding Hill, commanding a excellent view of the rising sun in the morning. The temple is famous for its large collection of ancient brick carvings portraying the Guanyin Buddha. Puji temple is the main temple for worshipping the Guanyin Buddha, the Goddess of Mercy. The temple boasts a mighty bronze Pilu Guanyin Statue with harmonious expression.